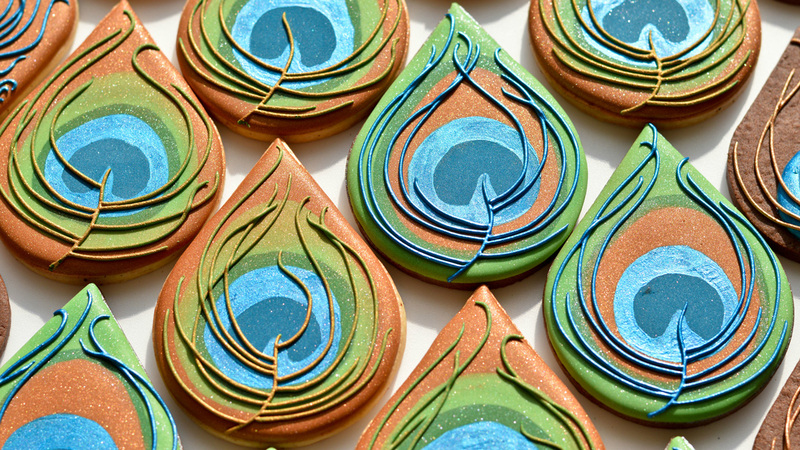 I recently had the opportunity to create a set of peacock feather cookies for my step-daughter's wedding. I've wanted to try my hand at these for ages, and thought it would be a doddle. Lovely colours, lots of lustre dust. But actually, when you look at a peacock feather, they're complicated things - a myriad of connected lines, branching out into waving strands, overlaid with 'solid' shapes of gleaming colour which seem different depending on what angle you view the feather from. 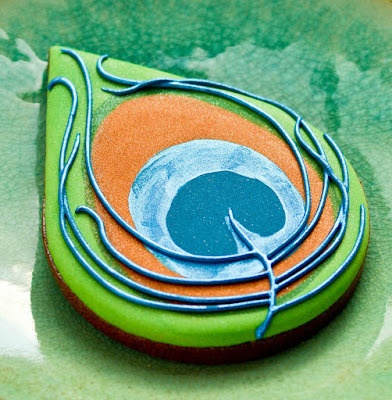 How on earth do you render this in royal icing without it seeming clumsy? Well, as usual, there are lots of lovely examples of how to do just that, as can be seen on my Peacock Feather Pinterest board (do you follow me there? You should - lots of inspiration!). And if you extend your search to other forms of art, there are plenty of examples. 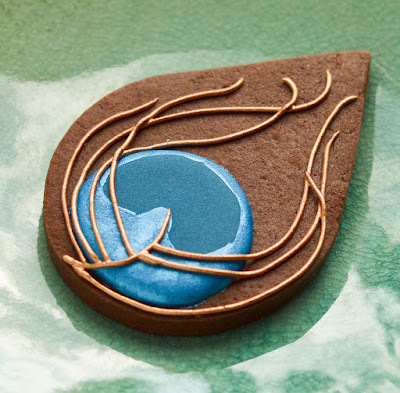 One of my favourites is this beautiful art nouveau brooch, which definitely inpsired my simplest design. But as usual, I wanted to make these cookies my own. 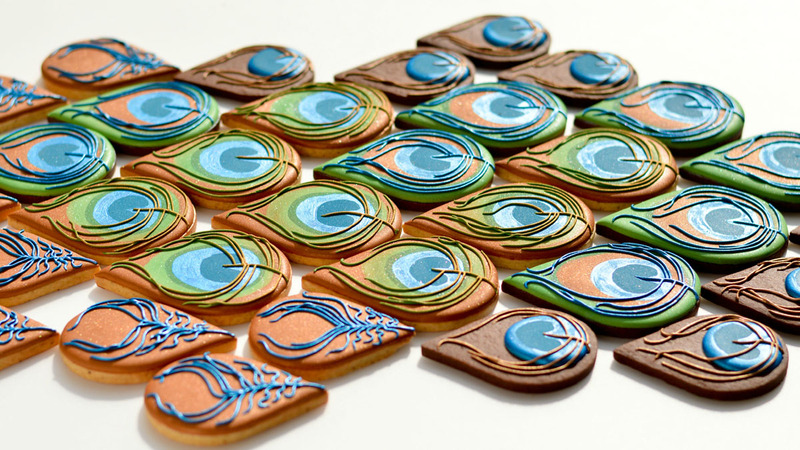 Click here for my Cookie Connection Hen and Feather tutorial! Carefully paint the light blue surround in metallic royal blue paint and allow to dry. 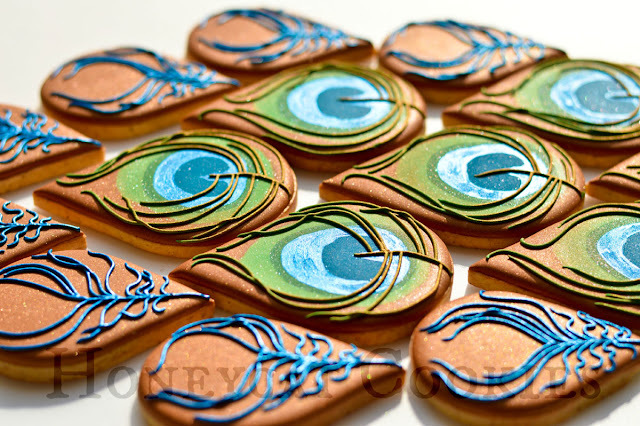 Using stiff beige icing, pipe a feather 'stem' from the base of the cookie up into the eye. From this stem, pipe random 'barbs' (yes, that's what they're called!) around and up towards the tip of the cookie, overlapping some, leaving some short. Allow to dry. Paint the barbs in dark metallic gold. Pipe the eye as before, using the two blues. 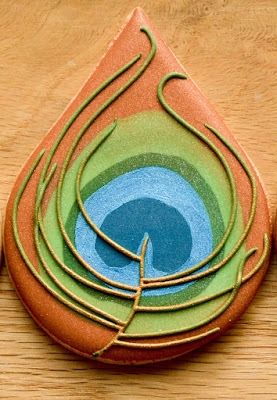 Without allowing it to dry, pipe a larger oval of bronze, a narrow band of dark green, and complete the flood with light green out to the edges of the cookie. Allow to dry. Paint the lighter blue outer 'eye' in royal blue metallic paint and allow to dry. Dust the bronze flood with bronze lustre, and the outer edges with green lustre dusts. Using stiff blue icing, pipe the stem and barbs as before, and allow to dry, then paint over with Royal Blue metallic paint. This is a variation on No. 2. 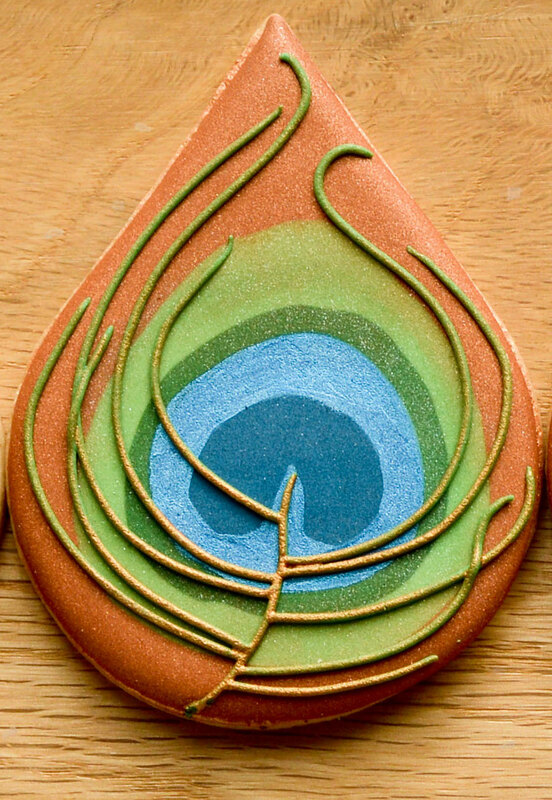 Pipe the eye as before, immediately surrounded by a narrow band of dark green, a wider band of light green, then complete the cookie with bronze flood. Allow to dry. Paint the light blue outer 'eye' with Royal Blue edible metallic paint. Dust the outer bronze area with bronze lustre, and the inner area with green, avoiding the 'eye'. Using the stiff green icing, pipe the stem and barbs as before. Allow to dry. Mix a dilute paint with Royal Gold lustre dust and clear alcohol. Start by painting the green piping from the stem outwards, allowing the green to show through, particularly towards the ends. Paint more layers on the stem and base of the barbs, to emphasise the gold here. Flood the cookie in bronze and allow to dry. Dust the entire cookie in bronze lustre dust. Using stiff blue icing, pipe a whole feather, leaving the 'eye' area clear. Allow to dry. Using Royal Blue metallic paint, paint over the feather and allow to dry. And there you have it, four feather designs (admittedly two are variations on a theme). It wasn't until I was finally arranging the cookies to photograph and wondering how I was going to put them out on the table at the wedding, that it occurred to me to make two peacock tail displays - two sheets of slate and they worked perfectly this way! 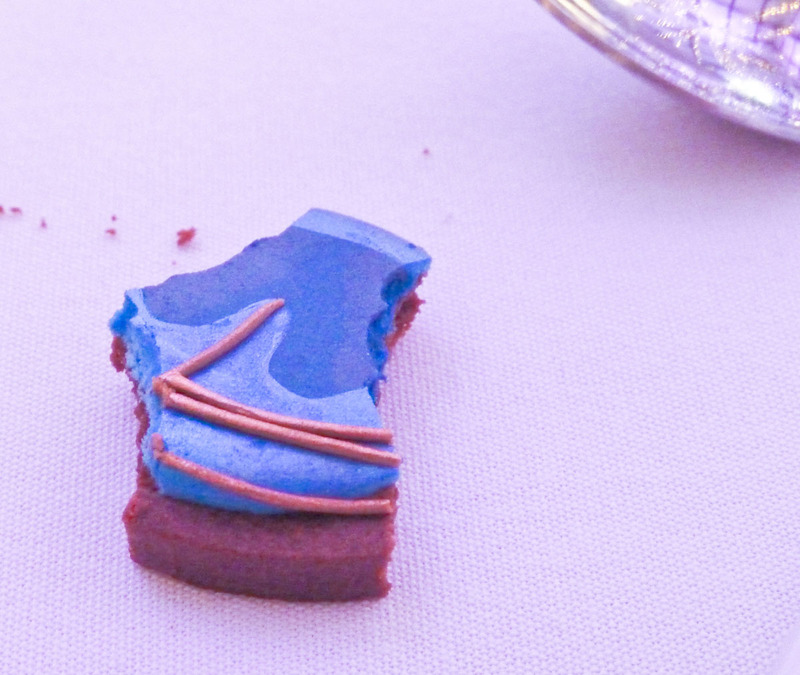 I was lucky enough to actually attend the wedding and see these cookies in situ (I did notice how the blue icing caused a temporary and mildly hilarious condition called 'blue lip'). The venue was lit with lilac uplighters and lots of fairy lights, and the metallic blue positively glowed!